We also provide many other resources which you many not be aware of or familiar with. To learn more about the resources available to you through the library, read on below, and please come speak to any member of our staff, or email us at libraryhelp@cshl.edu. The CSHL Library maintains extensive subscriptions to many of the most prominent scientific journals and publishers. Through our subscriptions, you will be able to access almost any research paper you could wish with the click of a mouse. And any article you might want that we do not have immediate access to, we can request for you through InterLibrary loan and have within 24 hours (typical turnaround time). To navigate journal subscriptions, you may be used to long alphabetical lists of journal titles to scroll through. But those have gone the way of mouth pipetting and Sanger sequencing. Please give a warm welcome to our journal management system, BrowZine! BrowZine provides easy access to all of the journals we subscribe to, either through topic navigation, a subject search (as seen on the left), or a simple title search. 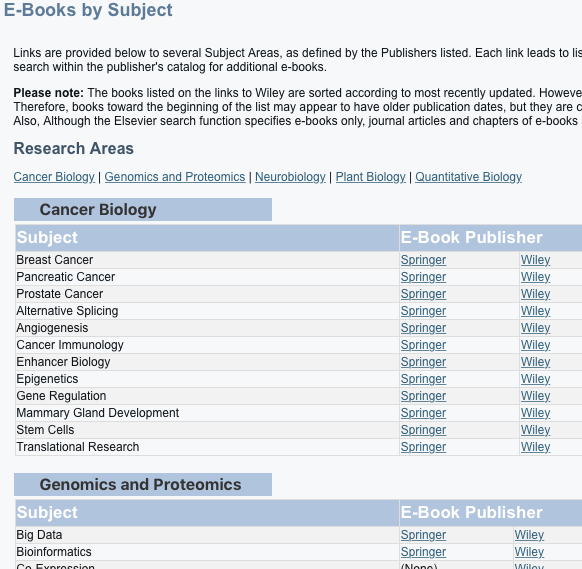 In addition to leading you to the journals and the articles within them, BrowZine also provides the ability to create bookshelves (shown below on the right). With a bookshelf, you can collate several journals into groups, such as Cancer Journals, Open Access Journals, Places that have Rejected my Papers, and so on. You can also favorite specific papers, to have all of your favorite data, or data pertinent to your latest project, at hand. Or, if you find that you prefer a more classic layout, where there is a page with a long list of alphabetical journal titles, we also provide that option, as found on the upper right hand side of the BrowZine title bar. For more information about BrowZine, please read our LibGuide. If you do come across an article you would like access to in a journal we do not subscribe to, it is very easy to get the article through InterLibrary Loan. 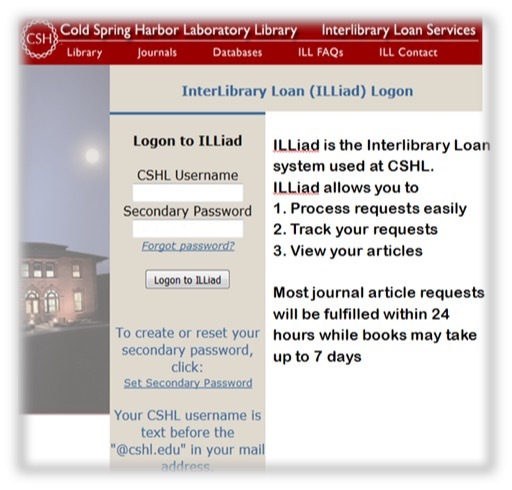 ILLiad is a simple, automated system for requesting copies of articles. When you first arrive at CSHL, you will need to do a one-time sign-up for the system, which our ILL-Librarian Gail Sherman will help you with during your Library Orientation. After that one-time sign-up, you will be able to request articles seamlessly. In addition to our journal subscriptions, the Library also subscribes to thousands of e-books from all major scientific publishers. The e-books are not only electronic copies of many published scientific texts, but also contain electronic-only texts or updates. So called Live e-books are also provided which are updated with new and revised information on a near constant basis. There are two (2) main methods for accessing these e-books. From the Resources drop-down menu on the Library website, you can select either "E-Books", or "E-Books by Subject" These will take you to two pages providing e-book access. 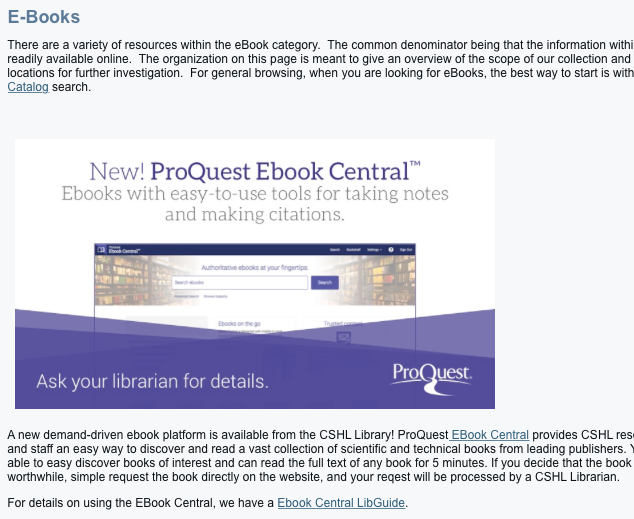 The first selection, the "E-Books" tab, will take you to a page providing access to ProQuest Ebook Central, a centralized resource for finding and searching e-books. Also provided are several other links to e-book providers, including scientific publishers like Wiley, Springer, and Elsevier, as well as the Oxford English Dictionary and Safari Tech Books. Perhaps a more simplified method of searching for the e-book of your choice is our curated "E-Books by Subject" page. 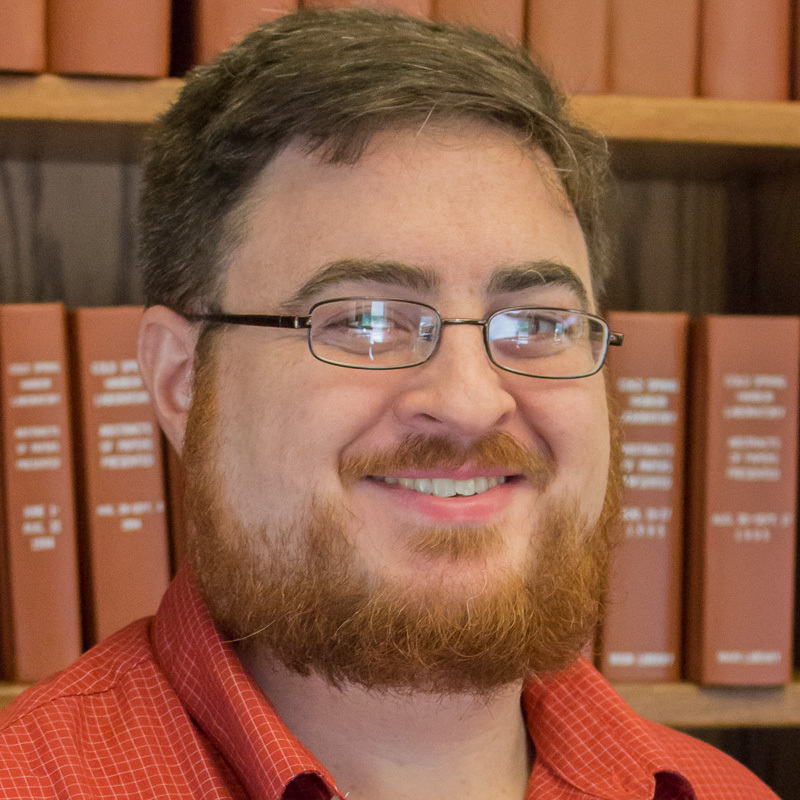 We provide here several tables of links to e-book collections, broken down by the 5 major scientific disciplines at CSHL, and the specialized topics our research faculty have expressed interest in within those disciplines. Each link will take you to the named publisher's website, showing books from the past 5 years, organized with the most recently published first. If you wish to have any subjects added to these lists, please contact Matt Dunn (x8825) at dunn@cshl.edu, and he will be happy to accomodate you. The Library is home to a large collection of textbooks, reference books, protocols, meeting abstracts, bound journals, and more - including the entire library of books from Cold Spring Harbor Laboratory Press. The books are located primarily in the Zinder room on the 1st floor, and the basement in moveable stacks. You can search our Library Catalog to find what you are looking for. If you need assistance, please contact either of our librarians, Paula Abisognio at abisogni@cshl.edu or Gail Sherman at sherman@cshl.edu. 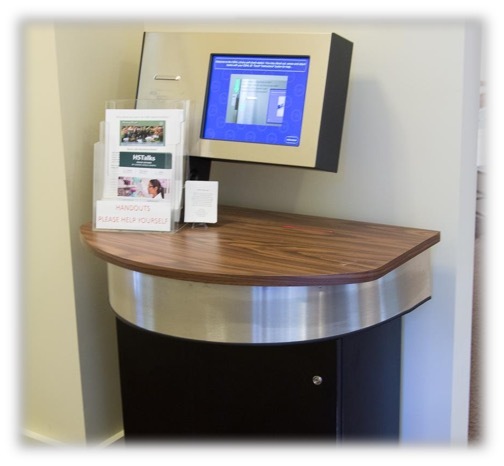 The Library provides two (2) self-checkout stations: one located in the front entrance hall of on the ground floor of the Carnegie building and the other in the basement main collection room. You will need to see Paula for a one-time set-up to get your ID card initialized before you can use them. For more information, please refer to our LibGuide on Borrowing Library Materials. 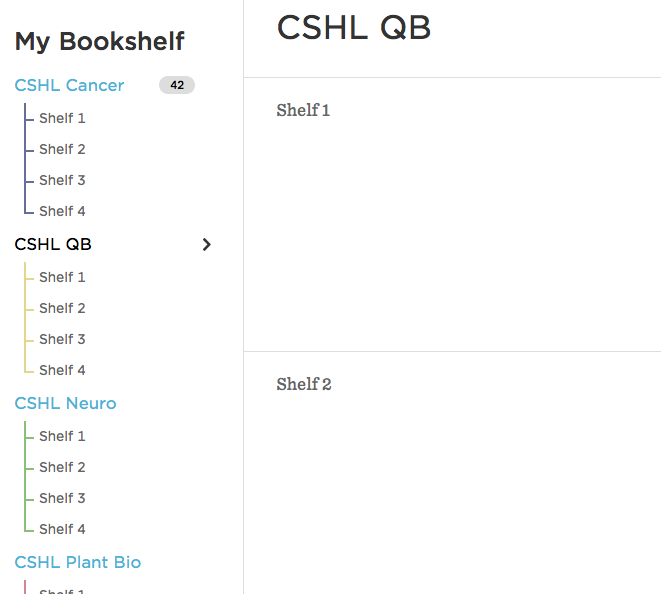 The CSHL LIbrary has created and maintains an Institutional Repository, a database which records all scientific output for the Laboratory. 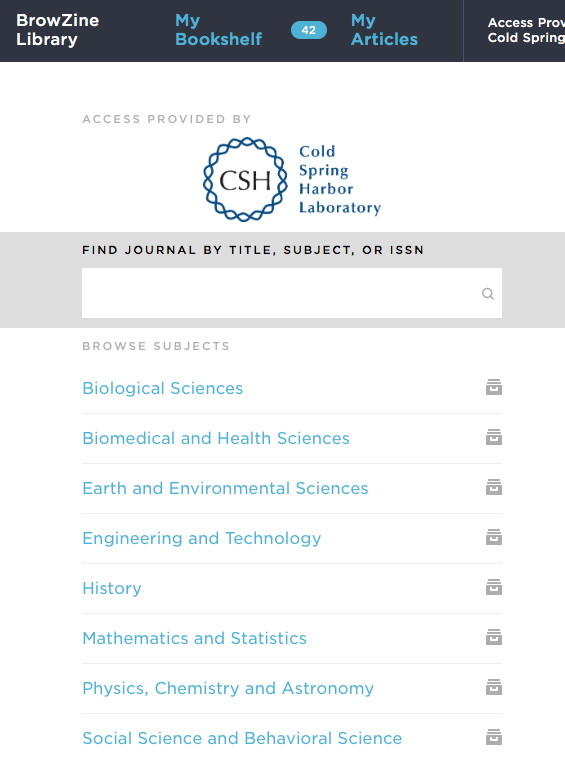 Every paper published from CSHL, datasets, conference abstracts, books and book chapters, and more are all cataloged, recorded, and cross-referenced in the Repository. There is even a birthday cake in the deposited within it. Feel free to ask about it. 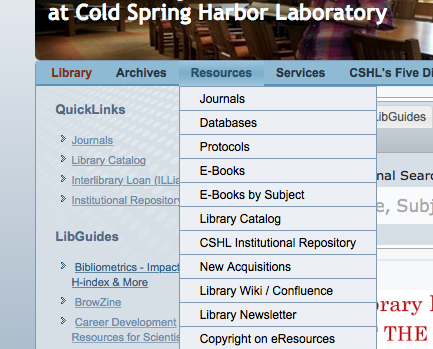 You can learn more about our Repository in the LibGuide about it, CSHL Institutional Repository. 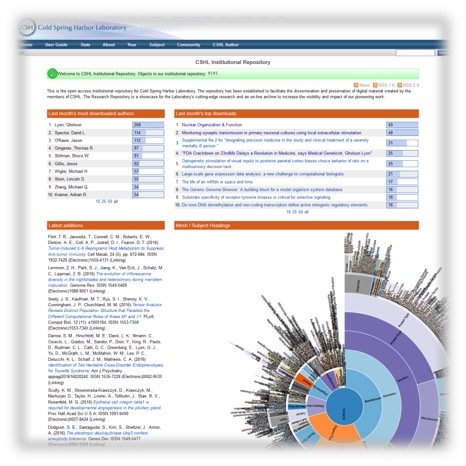 In addition to being a central clearinghouse for all research performed at the Laboratory, we also provide links to AltMetrics, a new measure of the footprint of scientific research in social media. A surefire way to get ahead in grad school and excel is to make sure your experiments work, and to understand why the protocols call for the steps they do. That's why the Library provide access to all of the Cold Spring Harbor Protocols manuals. These manuals have detailed explanations of the steps involved in how to do the latest scientific experiments, what each step is for, and what is going on molecularly, chemically, or biologically in each step. They are a wonderful resource to help experimenters understand their experiments, as well as to provide the information necessary to troubleshoot wayward and recalcitrant experiments effectively.